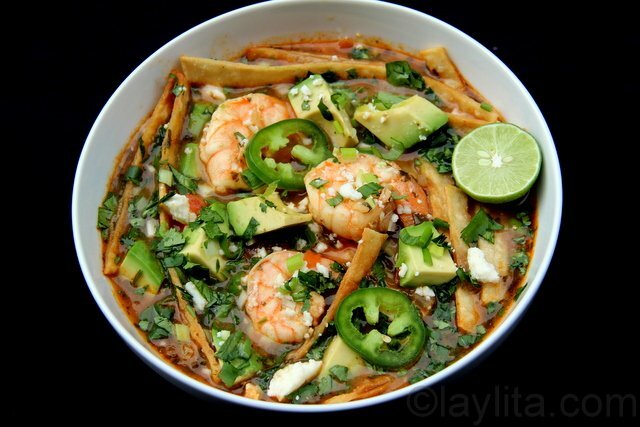 This shrimp tortilla soup is an ideal soup for anyone that loves spice + seafood combined into one delicious bite. 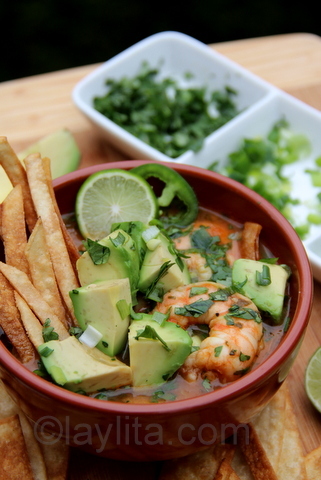 It is made with shrimp, cilantro, onions, garlic, jalapeños, tomatoes, spices, seafood broth, lime juice and served with queso fresco, tortilla chips, and avocado. 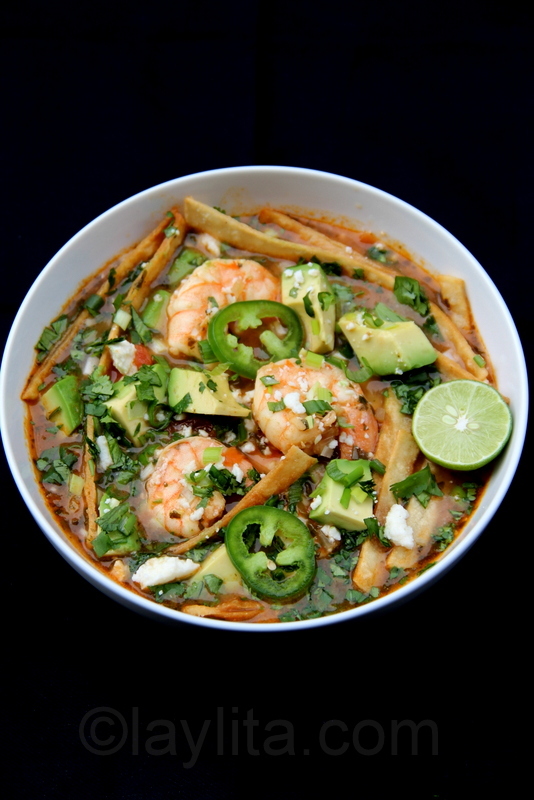 This recipe is a variation of my Uncle Clarence’s famous chicken tortilla soup. I lived with my aunt and him when I first moved to Austin, and loved it when he would prepare this classic tex-mex soup. 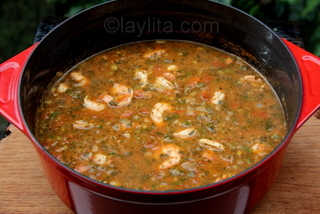 He prepares it with shrimp, instead of chicken, during Lent, and it is so comforting – I still have a hard time deciding if I prefer it with shrimp or chicken. 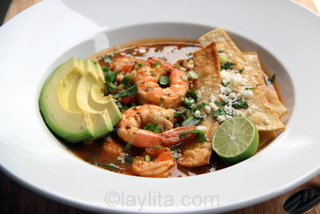 Shrimp tortilla soup recipe made with shrimp, cilantro, onions, garlic, jalapeños, tomatoes, spices, seafood broth, lime juice and served with queso fresco, tortilla chips, and avocado. 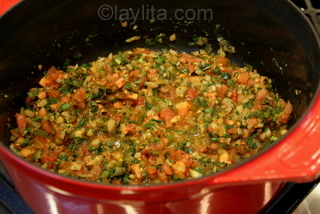 To make the refrito or base for the soup, heat the oil in large pot. 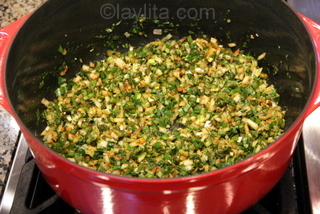 Add the onions, green onions, cilantro, jalapeños, crushed garlic, paprika, cayenne pepper, oregano, sugar, salt and pepper. 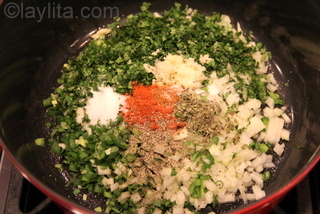 Mix well and cook on low heat for about 10 minutes. 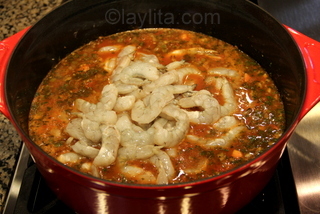 Add the seafood stock and tomato juice. 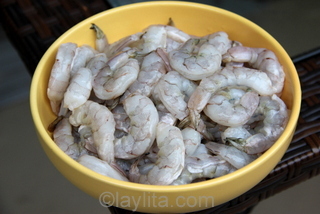 Bring to a boil, add the shrimp and cook until the shrimp are done (but not overcooked), about 5-8 minutes- more or less depending on the size of the shrimp. Serve immediately garnished with queso fresco, tortilla chips, diced avocado, chopped cilantro, green onions and lime slices. 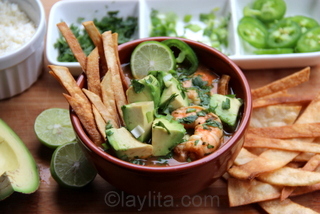 The shrimp soup is delicious on its own, but then add tortilla chips, queso fresco, freshly chopped cilantro, green onions and avocado on top and it becomes an amazing mix of flavors. This soup is on the spicy side, but just enough for you to feel the kick of spice without being too overpowering. 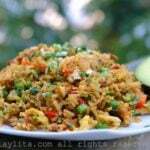 You can use just one jalapeño and less cayenne pepper for a less spicy version. On the other hand you can also double them for what my uncle calls the “wild stuff” version. 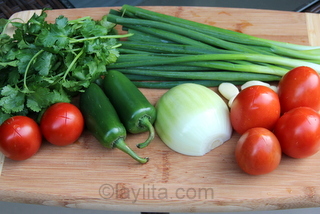 You can also serve some fresh sliced jalapeños on the side for those (like my 10 year old) who love it super spicy. 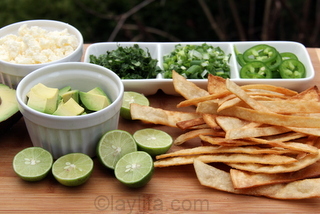 You can use store bought tortilla chips or you can also make your own at home. I like to make them into tortilla strips by cutting corn tortillas into long (wide or narrow) strips and then frying them in hot oil. It’s very easy to make them. 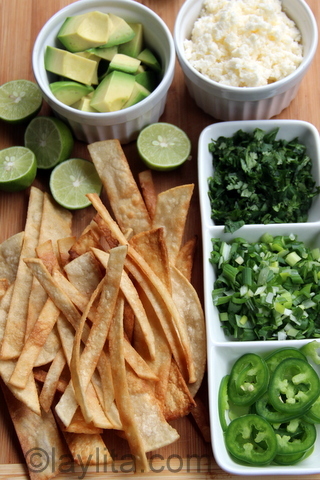 You can also bake the tortilla strips at 375F for about 7-10 minutes for a slightly healthier alternative. 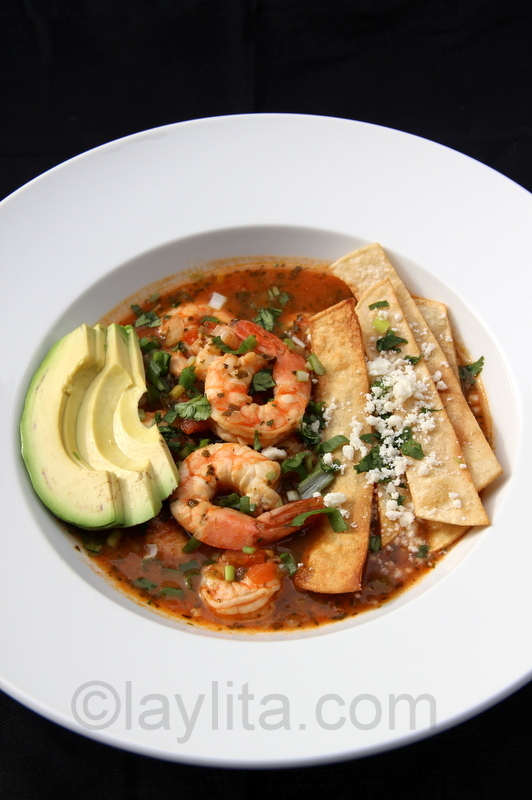 To serve the shrimp tortilla soup garnish it with queso fresco, tortilla chips, diced avocado, chopped cilantro, chopped green onions, fresh jalapeño slices, and slices of lime. It was my birthday today and I had to make it to celebrate, it was super amazing and made the horror of being closer to 40 a lot better. Even my husband loved it. Thanks for letting me celebrate with delicious food. Amazing! Couldn’t wait to make this so I used chicken stock instead and it was still incredible. Even my husband who hates shrimp loved it. Thank you. I can tell I’ll be making this over and over again. 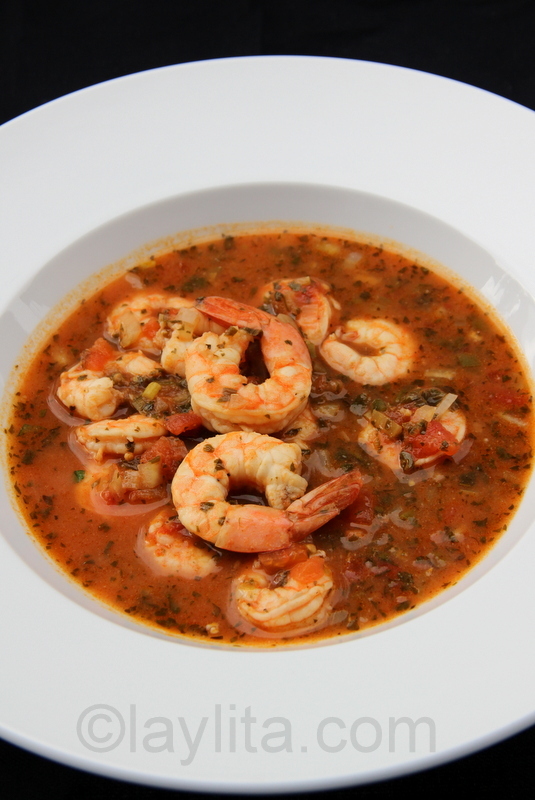 It’s a concentrated seafood broth, you can find it at most grocery stores in the same area as other broths/stocks. Most fishmongers/seafood stores also sell their own seafood stock. If for any reason you can’t find it, just use vegetable broth. It’s a little too warm in Austin to make this right now but I know my son will love it. It has all of his favorite things in it. This is a great recipe. 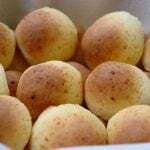 And very easy to make. That is why I absolutely love making Laylitas recipes. She keeps them easy to follow and very delicious. clams and mussels. It looked and tasted amazing! My guests swooned, thanks so much for the recipe! this looks fabulous. my kids are going to LOVE this, can’t wait to make it. 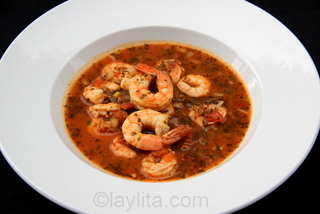 Hi, I have made this soup before, it’s fantastic! I want to make it for a large group of people, can I just double the ingredients? Yes, though depending on the heat level you want (or your guests like), you might just increase the amount of cayenne and hot peppers in a smaller dose (from 1/2 tsp to 3/4 tsp of cayenne and from 2 jalapeños to 3 jalapeños). Really nice dish looks delicious.. This looks delicious! 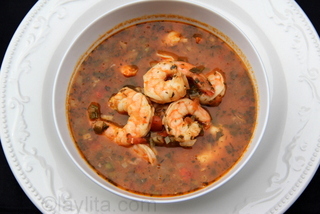 Where can I get seafood stock?